Thousands of individuals, corporations, and foundations make donations to keep Wright State University growing and to support excellence in teaching, research, service, and community partnership. Special giving societies have been created to recognize annual donors and those who have made significant contributions through the years. For donors who contribute $100 or more. 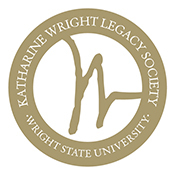 The First Flight Society reflects leadership giving at the following levels: Gold Trustees, Silver Trustees, and the President's Club. For donors who make cumulative leadership gifts of $10,000 or more. For donors who make arrangements for a deferred gift through a bequest in a will or living trust or other planned gifts of any size.